What if the hungry had not a cup of milk, but an entire cow? That’s what the founder of Heifer International, Dan West asked when he served as an aid worker on the front lines of the Spanish Civil War. This mindset for poverty and hunger addresses root problems, rather than putting a short-term bandage on a long-term wound. And Heifer’s approach has proven very successful. Over the last 73 years, they’ve partnered with communities in need to provide smallholder farmers with the resources they need to lift themselves out of poverty. The development strategy that powered their impact? 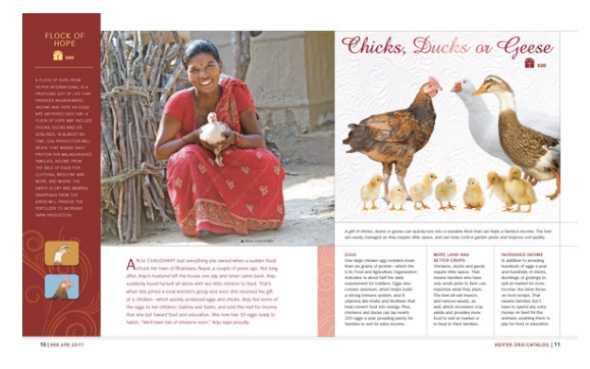 A print gift catalogue that provides donors with tangible examples of how they can make a difference around the world. While this method proved successful, as the times changed, Heifer found they were in need of a new strategy to engage a younger demographic. As Heifer began to build their online presence, they discovered the need to offer supporters a way to give back that personally connected them to the cause. With peer-to-peer fundraising, donors could easily share their passion for Heifer’s work and appeal to their own networks to make a difference they may have never thought possible. The decision to invest in their online ecosystem, and fundraising software, has allowed Heifer to expand their reach and identify powerhouse supporters to further nurture.